Electropop Visionaries see II become I on XII. Parallels' début, Visionaries, was one of the most swoonsome "Crystalline-teardrops-under-flickering-neon" electropop albums of recent times. Glamorously fragrant, sophisticated, infectious and bursting with poptasmic, timeless melodies to die for. Holly Dodson's porcelain-delicate, angelic, sugar-hush vocals proved the perfect foil for ex-Crystal Castles tubthumber Cameron Findlay's devilishly driven drums. An album of futurist promise, offering a parallel popworld where a youthful Madonna may have sensibly concluded "Mmm, y'know teaming up with New Order might be smarter than making wacky films about escaped cougars or singing vaudeville guff about being spanked". Indeed had it been released in 1987, Visionaries would've elevated them to the pantheon of the Fairlight Pharaohs and the Prophet-5, erm, prophets. Bangers like "Ultralight", "Reservoir", and "Vienna" probably would've brought about world peace, fed the starving and solved crimes too. But alas it was released in 2010 and sold about seven copies. Curse ye Gods, etc. So it was a double-downer when Johnny the shoeshine guy let slip that Findlay had put on his hi-hat, hailed a cab and bid a cheery adieu to pop immortality just as Parallels were about to press record on XII. But Dodson wasn't about to pack up and with her brother Nicholas and Pa Rich Dodson freshly roped in to bang the drums and twiddle knobs respectively, the beat goes on. ...and for the most part XII continues where Visionaries left off. Fizzy and fresh, "Ritual Dancer" is black lace 'n' pastel gloves-era Madonna with a golden lasso synth riff which threatens to twirl Wonder Woman-style into New Order's "Round and Round" at any moment. Stardust and salvation, it's a 4/4 stomp. Albeit a well-mannered, well-manicured one. "Come out of the darkness and into the light!" beckons Dodson. Elsewhere Sumner and Co get another nod 'n' a wink as the face-slappin' backbeat of "Time Will Crawl" channels their own "True Faith". A parade of geishas, spiralling firecrackers, and cascading Chinese dragon elegance further flourish it luxuriously lush. "Days of Summer" is better still, delivering some brooding, teary-eyed nostalgia. "Young and free we were seventeen / How beautiful those days had been". Down but not out, it's a bruised postcard to love lost and sparkles in the rain like Kraftwerk's "The Model". More sophisticated and sassier than most of its softer siblings it proves an early highlight. XII is all self-penned but Dodson's dozen hide one cover, "Moonlight Desires". A song so ultra-80's the original video not only involves one miraculously magnificent mullet but also said mullet singing on mountain high in full billowy shirt. Parallels give it a quick lick of Italo gloss with Dodson schmokin' 'n' schmoulderin' for her Heathcliff, "You stir my soul and wet my hunger... secret fires burn inside me"...and congratulations you're a winner. Alas XII's second half suffers some wobbles and creaks. "The Hands That Rule The World" is effectively Depeche Mode's "Everything Counts" - only not as good, obviously. It's Parallels' furrowed brow, "But seriously" chin stroker. Their "We can do issues too" track a la Human League's "Lebanon", Kim Wilde's "Cambodia", or Sting's "Russians". All paranoia, cold wars, puppet masters and cryptic musings about "Living in shadows". "Now we sink or swim in their ocean filled with lies!" it declares boldly whilst we think about what to have for dinner. The painting-by-numbers "Dover" is equally rum. Those "True Faith" face slappers are back but it's all a tad shoulder pads, A-ha cheekbones, and "Pining for the fjords". Elsewhere the apocalyptically-titled "Fury on Earth" proves more of a "Storm in a teacup" whilst the titular instrumental finale is a faceless, forgettable curtain closer. Luckily there is still some great reward within the deeper reaches of XII. The glitzy rave-pop of "Love & Devotion" could've graced Visionaries. The extended instrumental intro, the ragged, vintage electro bassline, the layered vocoder verses, the ecstatic blossom of the chorus and a chunk o' funky backbeat which recalls Paul Hardcastle's bonkers "19". It's a sultry dancer in the dark and moonlit glamorous. "I'm freeeeeeee", pirouettes Dodson and it feels like genuine exhalation. The rushing euphoria of "Electrimotion" is another eleventh hour highlight. An exhilarating, bursting-with-sunshine, hands-in-the-air release, "I feel alive tonight! Electrimotion! I'll be coming home!". It has proper, all-conquering disco potential and with the slightest bump to the beat could be a real game changer. But XII often lacks the dramatic dynamics and shady edges that made Parallels' debut so immersive. XII is so slick, so meticulously polished that, yes, it does often sound like a record made with your brother and your Dad. Findlay's powerhouse darkside drumming also contributed much to Visionaries' impact and identity, and XIIs rhythms can sometimes feel formulaic and flat by comparison. Perhaps the real punch lies in the lyrics. From "Ritual Dancer"'s intriguing "I fell for a darkness inside of a man" to the mournful ache of "Things Fall Apart"'s "You burned the bridges we had crossed / Why do you blame the ones you love?". XII offers a diary of broken trust, broken hearts, surrender, resurrection and waves of "Weathering the storm" imagery. Some may leave XII wishing more of this fiery, tempestuous passion had ignited the music too. 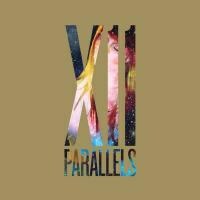 XII suffers by comparison with its poptastic predecessor but Parallels remain a promising proposition. Dodson's voice is hypnotic and coolly compelling throughout and when Parallels hit the ball - as on "Electrimotion" and "Love & Devotion" - they can still knock it out o' the park. But whereas Visionaries caught that perfect storm of light 'n' dark pop, there's sometimes too much that's light about XII.